There is no change in the domestic log market with log prices locked in for the fourth quarter and year-end rapidly approaching. There is little change in their export markets with continuing high demand from Australia and Asia for non-clearwood lumber. One mill manager referred to the markets as “same-same”. The weakening NZD has also improved current cashflows. Prices received for export logs delivered in November increased on average $5-$6/JASm3 from October prices for non-pruned logs and $1/JASm3 for pruned logs. While there has been a slight increase in ocean freight rates, the weakening of the NZD against the USD has more than offset this increased cost. Log stocks have increased slightly in China with no price movement. Due to the increase in prices for export logs the PF Olsen Log Price Index for November has increased to a record equaling $127. (See PF Olsen Log Price Index below). The average sale price is currently $12 per tonne above the three-year average. The domestic mills report very little change in domestic demand other than the usual variations due to weather. There have been a few slight changes in some export lumber markets, but these were well anticipated and had no effect on the local mills. Demand for pruned lumber is strong in all export markets except for Europe. This however, is not market driven as one of the major purchasers of pruned radiata pine timber is undergoing a major mill upgrade that is temporarily restricting capacity by about half. Dutch company Accsys Technologies is running stock down as it undergoes this upgrade and it has suppliers on quotas. This upgrade is expected to be completed about the end of quarter 1 next year which will double production. This timing will also coincide with the opening of a plant in Belgium from Norwegian company Kebony. Several New Zealand mills have been supplying more volume to the US market in the interim. Log supply continues to be balanced around most of the country. Some mills report a bit of extra log supply as the weather improves and woodlot harvesting increases. The market remains well balanced between supply and demand. The softwood stock levels across China have risen slightly to hover around 3.6M m3 mid November. Radiata pine makes up approximately 2.05M m3 of this stock which is up about 70,000 m3 from October. North American log stocks have increased by about 90,000 m³ since last month. Demand has reduced slightly with the onset of colder weather in the north of China reducing demand. Supply into China is currently about 70,000 m3 per day. The statistics from Q3 indicate a robust Chinese economy. GDP growth in Q3 was 6.8% (YOY), maintaining a strong growth range of 6.7%-6.9% for the last 9 months. Consumption is 64.5% of GDP which is a 2.8% increase on 2016. Fixed asset investment grew 7.5% YOY from 2016, and importantly for log and lumber demand, real estate development YTD is 8.1% higher than the same period in 2016. The Indian market is slowly rebounding from the introduction of GST as mentioned in previous Wood Matters. This recovery will continue if log exporters don’t oversupply this market as it recovers. The underlying demand for logs is still there. The Korean market had some sluggish orders for their export goods over their summer, but indications are that export orders are increasing. This is important for NZ logs as much is used in packaging for South Korean export orders. This is still a stable and solid market though. The ocean freight price to ship logs from New Zealand to China has increased by an average of $3/m3 USD across the country over the last month. Some market commentators indicate this may be the peak for 2017, but others are not so confident. Most exporters though are generally expecting ocean freight prices in 2018 to be higher than 2017. 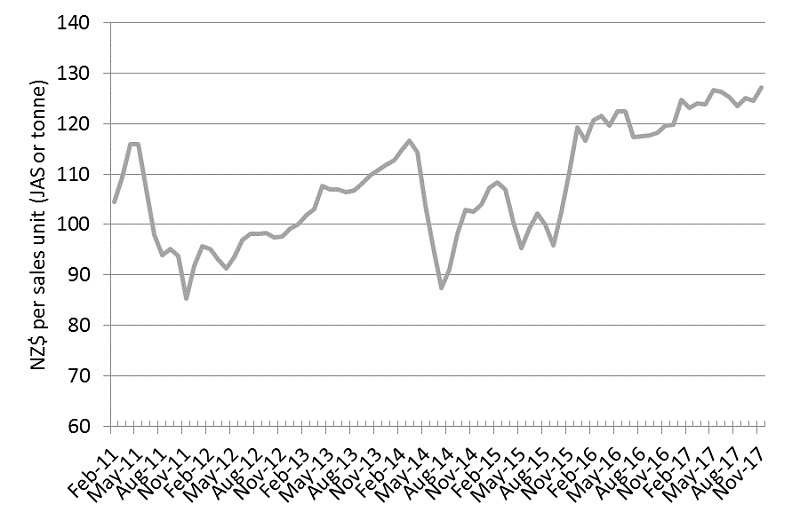 The price for fuel bunker has trended upwards since mid-June of this year, with a small dip in November. Bunker fuel prices are closely aligned with oil prices. 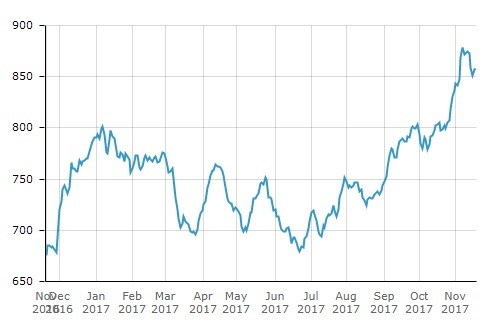 In early November crude oil prices passed the 60 USD per barrel mark for the first time in two years. This is largely based on the market expecting an extension of OPEC’s production cuts and a reduction in US crude oil stockpiles. BWI graph courtesy of S&P Global Platts. The exchange rate continues to have a significant impact on AWG prices for logs. The NZD relative to the USD has continued to drop from the high of 0.7503 in July to 0.6815 in mid-November. This reduction in the NZD has continued to counter the effect of rising freight costs on the ‘At Wharf Gate’ prices received for logs in New Zealand. The PF Olsen Log Price Index for November increased three dollars from the October index figure and is now at a $127 which is a record equal high with May of this year. The index is currently $5 higher than the two-year average, $12 above the three-year average and $16 higher than the five-year average. Since November last year the index has ranged from $120-$127. This indicates how stable the markets have been over this period.